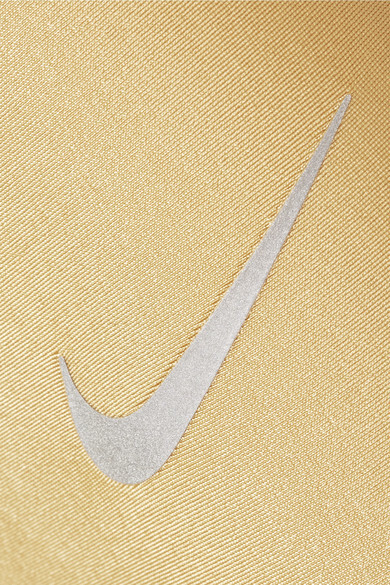 Nike's metallic 'Speed' leggings give a whole new meaning to the phrase "Going for the Gold". A supportive option for any type of training, they're made from the brand's moisture-wicking stretch fabric that's developed using the label's Dri-FIT technology to stabilize your temperature in every climate, and have silver panels along the sides. The hip pockets keep your phone and gym pass secure, while the high-rise drawstring waist ensures a comfortable, flattering fit. Shown here with: Nike Top, Nike Sneakers, Bang & Olufsen Headphones.